It is a real shame that the folks who produce the Memorial Day events at Santa Ana Cemetery and at Fairhave Memorial Park can’t work together and hold their events at different times. Instead, the Santa Ana Cemetery Memorial Day event began today at 10 a.m. and the Fairhaven event began a half hour later, at 10:30 a.m.
A larger crowd showed up at Fairhaven whereas Santa Ana Cemetery was awash in Republican politicans and even a descendant of the Confederates. State Senator Lou Correa was also at the Fairhaven event, but he was the only Democratic elected official. The Republican politicians included Supervisor Janet Nguyen, Supervisor Bill Campbell, Congressman Ed Royce, Assemblyman Chuck DeVore, and Tustin Mayor Pro Tem John Nielsen. I left the Santa Ana Cemetery event before the choir, from Orange High School, could perform “Dixie.” There was no way I was going to stand there and listen to that song, which celebrates the Confederates. I consider the Confederates to have been racists and traitors and do not think they should ever be honored at these ceremonies. Fairhaven’s ceremony was packed. I ran into Santa Ana Latino activist Zeke Hernandez and Assemblyman Jose Solorio. I saw Santa Ana Councilman Carlos Bustamante, sitting with Tustin Mayor Jerry Amante. I was told that Congresswoman Loretta Sanchez and the rest of the Santa Ana Council Members were there, but I could not see them through the crowd. I thought I saw Anaheim Mayor Curt Pringle, sitting with Amante and Bustamante. Several vintage military jets flew overhead during the event. I was able to snap a couple of pictures of them. The speaker, who appeared to be from the U.S. Navy, spoke eloquently about soldiers who died in battle, but I didn’t like it when he asked us to honor those who fought in the U.S.-Mexican War. Why even bring that unjust war up? The Fairhaven event also featured a classic car show and a series of famous war photographs. You can see those in the picture slideshow atop this post. Again, it is sad that these events compete with each other. You would think grown ups could get together and find a way to work together, particularly for such an important occasion. I guess not. « Is it a giant waste of time to work on the Loretta Sanchez re-election campaign? It is so funny strange how individuals write comments withot knowing th e whole story. As the Chair of th Tri-City (Orange, Santa Ana, Tustin) Memorial Day Committee let me straighten out a few hings. 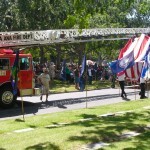 Every state, county, local elected official was invited to the Santa Ana Cemetery Memorial Day event. It so happens the ones who responded in the affiramtive were those who showed up, they happen to be for one reason or another Republicans and one Democrat. This event at the G.A.R. Monument in Santa Ana Cemetery has been observed on and off since 1881 or 1882 in the heart of Santa Ana. The only one in attendance from the Santa Ana area was State Senator (Marine Veteran) Lou Correa we did not receive any regrets to our invite from any of the leaders of Santa Ana except Loretta Sanchez’s Office. Many of the leaders have numerous events to go to and those who showed did it because we are made up of vounteers from the Veterans Organizations and Community Organizations, and not one of us is paid to put this together. We do it to honor thsoe who built this great nation in deference to their race, color, creed or national orgin. I as a decendant of a Union Veteran who fought at Vicksburg. In the begining had a simialr attitude to those who fought in the Confederacy but have learned the history and the lives they built here in early Orange County. These people helped to unite communities in which we live in and laid th efoundation on which we live with today. Union or Confederate they followed what President Lincoln stated in hsi 2nd Inaugal adress and that was to “help bind up the nations wounds.” The premise of the Civil War was not just slavery but many other factors. These veterans fought for what they believed in but moved on and it it is not the darkside of the war we honor but the indivduals who served from all the wars. Yes the program went a little long and we will address this for next year but this was the first time we had this great of a response and were not going to let it go. As for your comment on the music “Dixie,” President Lincoln requested it to be played by the Union Band on the report of Lee’s surrender at Appomattox Couthouse April 9, 1865. If he can honor those who fought in the war with that song we too can. Sice ou left early you missed the choir sing great patriotic music such as, “One Great Nation'” “Battle Hymn of the Republic,” “Medley Salute to the Armed Forces,” and “God Bless America. : You also missed NJROTC Battalion CDR Robert Macias reciting the “Gettysburg Address.” Three students from our area won Veterans Oratorical Contests and recited their speeches, and much more. There was an array of honors to all who have fought, died in action, and thsoe who came home, took care of their families and continued to build a nation. As far as the conflict with Fairhaven, they started their ceremony in years past at 11:00 A.M. and for some reason moved it to 10:30 A.M. Their’s is a commercial endeavor, ours is a community event. In the future learn about the events before making such generalized comments, as you show your bias. Also, it might help to stay for the entire service and learn taht we had the Sons and daughters of Union Veterans who honored our dead with cannon salutes and the VFW Color Guard horing with a 21 gun rifle salute. All were honored. Info on both events was hard to come by. Thanks for expanding on what I reported. I think you folks need to coordinate with Fairhaven. Having the events at the same time is ridiculous. As for the confederates, you are not going to change my mind. What you failed to acknowledge is that the KKK was a major force in Orange County and Santa Ana because of the damnable Confederates. And playing Dixie didn’t prevent a Southern maniac from shooting Lincoln. Perhaps you would get more involvement by Santa Ana officials if you dropped the promotion of offensive Confederates? Also, every single Republican politician at your event was a documented Mexican-hater. Not good.